Black/Red Wonderland flower is 7cm across at the widest parts. The centre is made from a twirl of different Red zips. The unusual multi coloured metal teeth give a jewel-like interest to the centre. and outer petals,everything is carefully hand stitched together. There is a brooch pin on the reverse side so you can pin them to your favourite outfits/hat /bag/coat. Just imagine it on your favourite coat or jacket! Or if you prefer I can convert it to a hairslide or hairpin for a small charge of $1.50 to cover the extra materials. 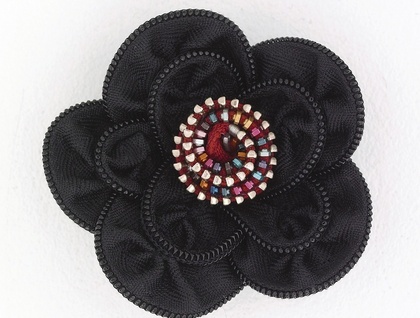 You can also pin it to a velvet ribbon and tie it around your wrist for a glamorous corsage or even a neck choker. Or tie it as a headband or scarf tie.